Rice Hulls offer improved insulation by allowing the animal to heat the air layers that exist within the hulls. The combination of the hulls and the heated air layers insulate the animal from the cold flow. Rice hulls will protect your animal from dampness because of their unique silica properties. The rice hulls will remain dry providing comfortable and healthy bedding. This eliminates any side effects from bacteria and mould caused by damp bedding. 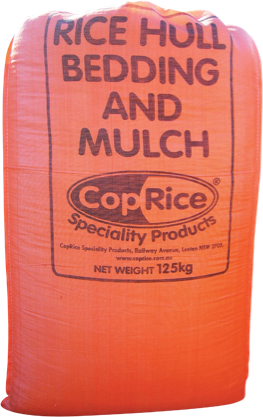 Rice hulls will mould to the shoe of the animal providing a cushioning effect against any hard surfaces. This results in less foot and leg troubles and improved joint performance. Rice hulls are not an attractive food source, and will not be eaten by the animal. Unlike alternative products which are eaten by the animals instead of being utilised as bedding. Rice hulls remain insect free, improving your animals comfort and health. Rice hulls are a renewable resource that is processed without any chemical additives. No trees are destroyed in the production of this product. Rice hulls require less frequent replacement than other alternatives due to their silica properties, making them a very affordable product. Rice hulls are produced by Australian farmers and packed by and Australian company – CopRice. Want to find out more, or simply enquire about this product?